Convergys ISE Calibrators contain stabilized saline standard solutions, intended for the 2-point calibration of our Convergys ISE comfort and auto analyzers. 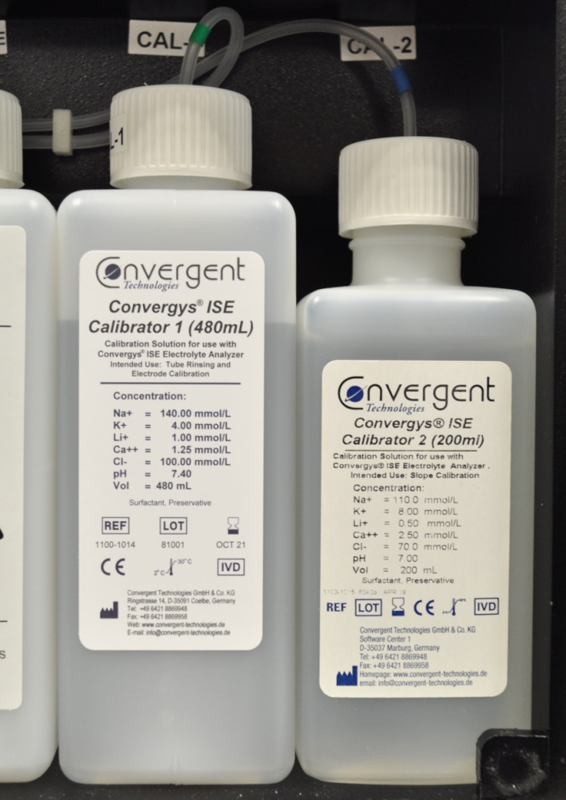 Convergys ISE Calibrator 1 contains 480 ml of reagent. The Convergys ISE analyzers use Calibrator 1 also as rinsing agent. Each bottle of Calibrator 1 comes with one single-use RFID card for unlocking the reagent during installation in our ISE analyzers. Convergys ISE Calibrator 2 contains 200 ml of reagent. Stored at 5°C to 30°C the calibrators have a shelf life of 24 months from the date of manufacture. Once opened, the reagent is stable for 60 days when installed in Convergys® ISE analyzers (at 15°C to 30°C, if not contaminated while handling).